Our two-year Conducting Fellowship programme is for young conductors on the verge of a career. The Fellowship is offered in association with the BBC Scottish Symphony Orchestra and the new music ensemble, Red Note, and includes a bursary of £15,000 per year for the succesful candidate. The Conducting Fellows will work extensively with the Conservatoire’s Artistic Director of Conducting, Garry Walker and with all the orchestras and ensembles within the Conservatoire. 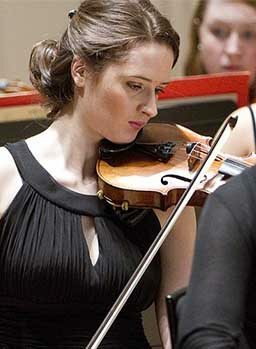 The position will provide a unique blend of training within the context of a supportive Conservatoire environment and extensive professional links, both with the BBC Scottish Symphony Orchestra – where Fellows will act as assistant to their Chief Conductor Thomas Dausgaard – and other principal Scottish performing arts organisations such as the Royal Scottish National Orchestra, Scottish Opera, Scottish Ballet and the Scottish Chamber Orchestra. The aim of the programme is to provide a final bridge between a young conductor’s postgraduate study and their eventual access to the profession itself. Previous Conducting fellows who have made succesful entries into the profession include Jessica Cottis, Fergus McLeod, Ciaran McAuley, Holly Mathieson and Jiří Rožeň. Applications for the Leverhulme Fellowship in Conducting for 2019-21 are now closed. Applications for 2020-22 are expected to open in September 2019. The initial application is by means of two contrasting videos, preferably including both performance and rehearsal time, accompanied by a CV. Auditions for shortlisted candidates are likely to be held in March 2020. The Conducting Fellowship is open to applicants of any age and nationality. Please feel free to contact Dr J Simon van der Walt, Conducting Co-ordinator, if you have any further enquiries about the Fellowship js.vanderwalt@rcs.ac.uk.